I recently had the privilege of traveling with David Spencer, who is our partner in church planting ministry in Eastern Kentucky, and Joe Hardman, a NHIM Board Member. We were journeying to the “Calaboose” area of Wolf County, KY. After we left the town of Campton, we made several turns, each seemingly onto a narrower road. 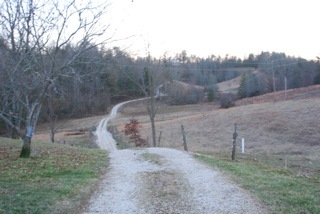 Finally, we turned onto a narrow gravel road leading to the rather remote home of Hershel Lykin. Hershel greeted us from his bed in the front room. He is bedfast. A deteriorating spinal condition has confined him to bed, only occasionally getting up for short times in his wheel chair. Hershel’s physical disabilities have put him in a place of confinement commensurate to the name of the area where he lives. He is in the ‘calaboose’, a personal local jail. No longer able to attend church, Hershel longed to be useful in the Lord’s service. His spirit is strong, and he has a fervent desire to work for the Lord. February 19th, 2013, was a signal day in the life of Hershel and our Eastern Kentucky ministry. David, Joe, and I were at Hershel’s home where friends and family had gathered for a special service. We sang hymns, shared scripture, and worshiped together. 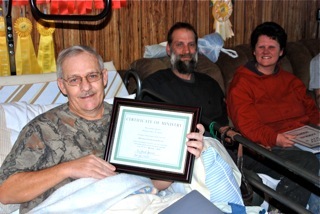 We then laid hands on Hershel and commissioned him as our Minister of Intercessory Prayer. God is using Hershel’s situation to a double benefit. First, his prayers are going out touching lives and empowering our ministry. The second benefit comes because his mind is occupied with his important role as an intercessor, and that helps muffle the pain. Hershel’s friends Melissa and Seth were at his Commissioning Service on February 19th. On Sunday Feb. 24th, Melissa and Seth went forward at Bear Pen Worship Center and committed their lives to Christian service. What a beautiful exclamation point to this ministry! How many of us are missing a great opportunity for service? Circumstances may attempt to put us in the ‘calaboose’. Pain, disability, or isolation will tell us we are of little use in the Kingdom of God. We need to know that whatever our physical status may be, our spirits can soar as “the Lord gives freedom to the prisoners” (Psalm 146:7). Will you accept the challenge of being an intercessor?